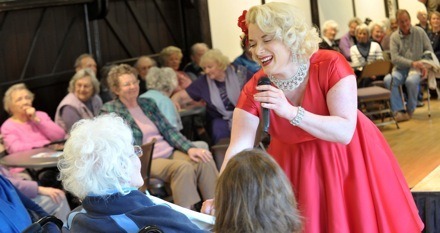 People of all ages across the UK receiving palliative support benefit from our music sessions. Coupled with the extraordinarily positive and caring ethos of hospice staff, live music has a remarkable capacity to divert and distract from pain and anxiety. This can provide a sense of normality which enables patients to enjoy a concert as a social occasion along with relatives, friends, and staff. Please give today to help us bring live music to people of all ages in hospital & care across the whole of the UK, to a venue near you. 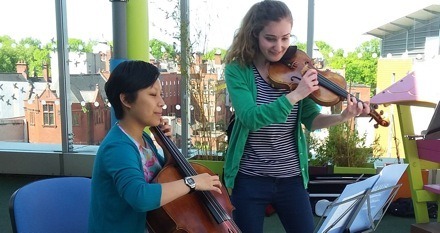 Copyright © Music in Hospitals & Care - a Registered charity in England and Wales no. 1051659 and SC038864 in Scotland. Company limited by guarantee registered in England no. 3138683. Registered office address: Unit 40, Enterprise House, 44-46 Terrace Road, Walton on Thames, Surrey KT12 2SD.